We're calling it: Finding your own unique signature scent has never been easier, thanks to a boon of homegrown, under-the-radar fragrance brands with very talented noses behind them. And since we're just a tad fragrance-obsessed here at Byrdie, we have no problem hunting down the biggest stars on the rise. And here they are: a very special selection of brands that are collectively shattering the mold of what a "typical" perfume should smell like, not to mention how they should be formulated. Retailers are taking notice—their cult fandoms, on the other hand, are way ahead of the game. What to try: Echo Lake ($48), a gorgeous, warm blend of patchouli, sandalwood, jasmine, musk, and incense. This fragrance has a comfortable feel, like a weekend morning. 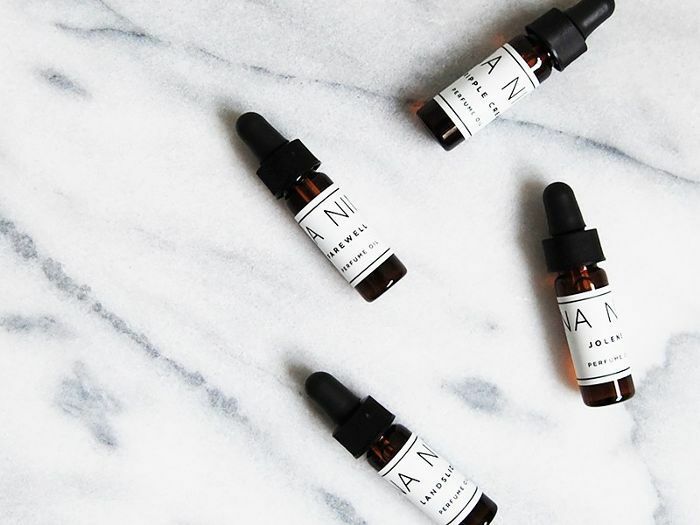 Kristeen Griffin-Grimes has seen her Seattle-based Etsy business completely explode this year—but it's just as well, since her natural formulas (and super-cool minimalist packaging) are top-notch. What to try: Madame Blond ($52), free-spirited, Mediterranean-inspired mixture of citrus, rose, thyme, patchouli, and vetiver. After getting quite the successful start on Etsy, Goest has since expanded to its own virtual storefront—as well as a few others. While the characteristically pretty fragrances are available in full-size atomizers and travel-friendly rollerballs, the teeny-tiny flacons (like the one seen above) have a particularly undeniable appeal. What to try: Grand Tour ($34), a sporty cocktail of citrus, cedar, herbs, and leather. On the flipside, Jackal ($34) feels more raw and sensuous, with notes of chocolate, smoke, patchouli, and vanilla. When you've found a fan in Madonna (for real! ), it's safe to say you've made it. Crafted by industry veteran Julie Wray, Olivine's scents—not to mention bath and hair products—have an unabashedly girly vibe that can be appreciated by all. What to try: Amongst the Waves ($48), a dreamy interpretation of the beach with three kinds of lily, sandalwood, musk, and tonka bean. Consider Gigi ($48), the brand's best-selling scent as well: This more flirtatious fragrance has notes of fruit, ylang ylang, gardenia, vanilla, sandalwood and musk. Based in Houston, Valchemy boasts all-natural formulas with a high-end feel, ranging from hair mists to balms to—you guessed it—perfumes. Try: Siren ($56), an aptly named, seductive blend of night-blooming jasmine, tonka bean, sandalwood, tuberose, and hay. What to try: El Cosmico ($150), a grassy, earthy concoction meant to evoke the atmospheric desert of Marfa, Texas. We've been fans of this Brooklyn-based brand for some time, but the much-deserved buzz shows no signs of stopping—well beyond its NYC environs, we might add. What to try: Hunter ($95), a slightly masculine mix of bourbon vanilla, tobacco, and balsam that's evocative of your coziest flannel. Another fave is Maine ($95), which epitomizes the salty-sweet air of the Northeastern coast with notes of clary sage, rose, seaweed, and myrrh. In 2009, Richmond Virginia-based Kate Jennings started Na Nin as a vintage clothing line. In the years since, it has expanded into a full-fledged boutique—complete with its propriety fragrance collection. The scents, which are all inspired by songs of the '70s, have a definite hippie-rocker vibe. We were admittedly first drawn to Apoteker Tepe when we noticed those gorgeous bottles popping up in some of our favorite boutiques. But believe it or not, the fragrances manage to even outdo that pretty, pretty packaging. What to try: The Peradam ($130). With luscious notes of jasmine, butter, and sandalwood, this perfume has an addictive, uniquely beautiful depth to it. Persephenie Lea handcrafts her line of fragrances, body oils, and aromatic candies—which are astonishingly addictive—in Los Angeles. Most of her offerings have an exotic, far-Eastern feel. What to try: Datura ($60), a beautifully balanced blend of jasmine, lily, caramel, and musk. It's mesmerizing but not at all cloying, and subtle enough for someone who doesn't usually tend toward floral fragrances. Clean, simple, and nature-inspired, Laboratory's fragrances are also unisex. What to try: Samphire ($89) has all the fresh greenness of early spring, thanks to notes of citrus, lavender, basil, rosemary, and slightly earthy notes of white amber and oak moss. Founded in Brooklyn by the Grasse-trained, very talented Julia Zangrilli, Nova is unique in that its focus is on painstakingly crafted, custom-made blends, as well as collaborations with brands like Opening Ceremony and jeweler Anna Sheffield. What to try: Sultan ($46), a smoky, woody scent created for Loup Charmant. Of course, you really can't beat getting your own scent crafted by Zangrilli herself. Smoke was actually created in New Orleans entirely by accident, when founder Kathleen Currie was experimenting with different essential oils and was blown away by this blend. She knew she had something special on her hands, so to speak—and we think the perfume's cult fandom would agree. What to try: Trinity Perfume Set ($75). Currie has since expanded beyond her original Smoke, which is heavy on vetiver and also includes notes of citrus and jasmine. The other two scents are warm, earthy Ritual (patchouli, rose, cinnamon, neroli) and Wellspring (amber, peppercorn, ylang-ylang, and cacao). What to try: Sunset Blvd. ($40), evocative of the classic movie with dramatic notes of yuzu, patchouli, cinnamon, rose, and tonka bean. Los Angeles–based Dasein offers four seasonal scents that feel quite literal yet beautifully wearable. What to try: Winter ($95), which somehow manages to make the combination of spruce, cardamom, pine, and lavender feel like a luxe, everyday fragrance and not a car freshener. Which of these scents are you eyeing? Tell us your fave in the comments below!